Phillip D. Bowman, Mount Gilead, and Jennifer A. Walters, Mount Gilead. Jonathan P. Bowyer, Cardington, and Katie L. Perry, Cardington. Wade A. McAvoy, Cardington, and Jeaneen A. Brown, Cardington. Certificate of transfer in estate of Lillie Ruth Deel. Entry setting hearing and ordering notice, hearing 8:30 a.m., Feb. 26, south court room in estate of Rosanna June Nida. Entry approving and settling account in estate of Larry C. Belcher. Waiver of notice of hearing on account in estate of Hans Rudolph Bachmann. Entry approving and settling account in estate of William R. Kuykendall. Entry – Report of distribution of wrongful death and survival claims Entry approving and settling account in estate of Peggy D. Jenkins. Application to reopen estate to report newly discovered assets; Entry approving and settling account in estate of James Lyscum. Journal entry, amended surviving spouse, next of kin; Entry approving and settling account in estate of Helen Irene McQueen. Waiver of notice of hearing on account in estate of Thomas E. Plogher. Waiver of notice of hearing on inventory, hearing 8:30 a.m., March 2, north court room, in estate of Lewis C. Nicodemus. Entry setting hearing, 8:30 a.m., Feb. 27, south court room, in estate of Brian Allen Augenstein. Entry granting motion to dispense with appraisal in estate of Gregory M. Myers. Amended surviving spouse, next of kin in estate of Bruce A. Adams. Application to extend administration in estate of Thomas David Marcum. Entry setting hearing and ordering notice, hearing 8:30 a.m., Feb. 21, south court room, in estate of Keith A. Strait. Judgment entry – report of distribution in estate of Lois Ann Hawk. Entry setting hearing and ordering notice in estate of Tommy W. Lilly. Entry extending time – Inventory in estate of James L. Brand. Judgment entry order approving inventory and appraisal in estate of Glen Ruhl. Application to relieve estate from administration, hearing 11 a.m., April 4, south court room, in estate of John H. Fraley. Entry approving appraiser in estate of Melvin O. Swartzentruber. Entry setting hearing and ordering notice, hearing 10 a.m. Feb. 28, north court room, in estate of Robert Louis Thomas Jr. Entry granting additional time in estate of Doris Rutherford Cannon. Hearing notice, 9 a.m., March 20, north court room, in estate of Jerry L. Williams. Hearing notice, 2 p.m., March 14, south court room, in estate of Dolores Nan Dewitt. Application for certificate of transfer in estate of Robert C. Curren. 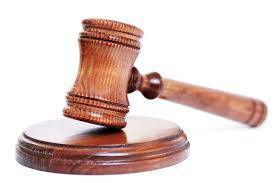 Motion to extend filing of inventory and appraisal in estate of Theodore Everett Denney. Certificate of death filed, waiver of notice of probate of will, original will filed, fiduciary’s acceptance in estate of John L. Pearce.